Angelique Kourounis’ “Golden Dawn: A Personal Affair” has provoked several discussions at this year’s documentary film festival, capturing in sharp detail the phenomenon of Golden Dawn in Greece through interviews with supporters and party leaders. Her intention in this, her third film is to show us what is in the mind of the Golden Dawn supporter next door, and to show us that the monster of fascism is growing more gigantic daily every day in front of our eyes. It helps us to realize that this is indeed a personal affair that affects all of us. The director and journalist-correspondent for several French media outlets has been following for years not only marches and party rallies, but also speeches, recording everything with the camera, but also with her phone if necessary, with the agreement of the party. 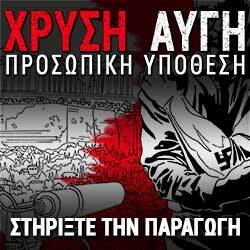 The documentary, among other things, shows the relationship of George Roupakias, the killer of Pavlos Fyssas, with the leadership of the party and shows the close relationship of Golden Dawn with Nazism. It shows the manipulation of the middle classes, who are unable to make ends meet because of the crisis, as well as recording Golden Dawn’s assault squads and the relationship of the organization with the police, but also to criminal activity. So why is this a personal affair for her, and why is she risking this confrontation with fascism?